alan sloman's big walk: Summit to Eat Freeze Dried Meals: Review, NOW WITH UPDATES! 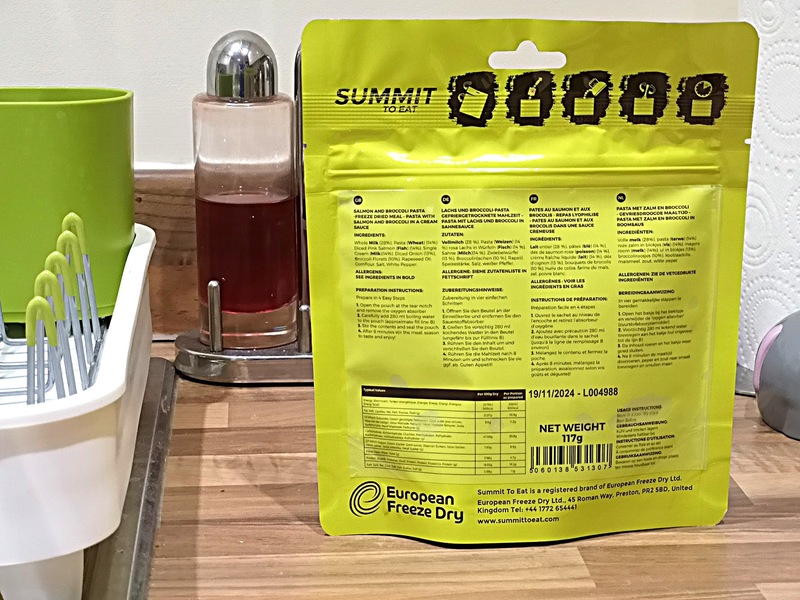 Summit to Eat Freeze Dried Meals: Review, NOW WITH UPDATES! With three hundred days to the start of the fortieth Great Outdoors Challenge - you will have spotted the new countdown clock over to the right, I'm sure - my keyboard has once again been pressed into service. 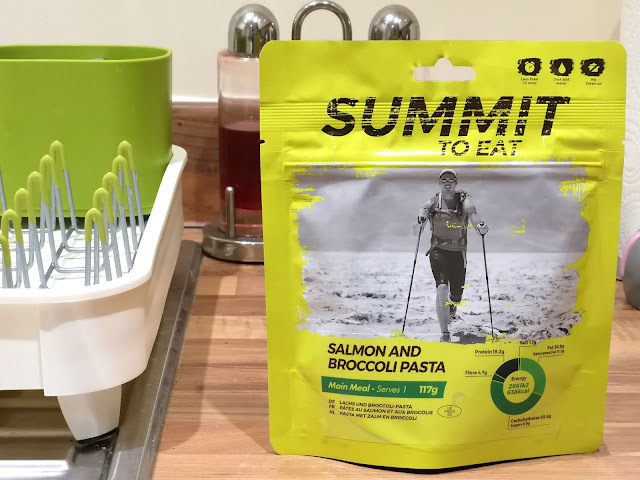 Prior to this year's TGO Challenge, Lauren - an Outreach & Digital PR Manager - asked me if I would be interested in testing some free meals for her client, Summit to Eat. The meals didn't make it in time to take on the Challenge, and so there's been little opportunity for me to test them in the field / up a hill / on a mountain / in my beautiful Trailstar. I had a bit of rotten news this afternoon that made me feel I'd been punched in the solar plexus and consequently didn't feel like spending time creating another culinary sensation in the kitchen - I'm sure that that Blumenthal fellow pinches all my best work - and so seized the opportunity to catch up on my promise to Lauren. So, Heston - I know you're reading this - here's how to make a first class Salmon & Broccoli Pasta dish. Boil a kettle. That's not difficult. 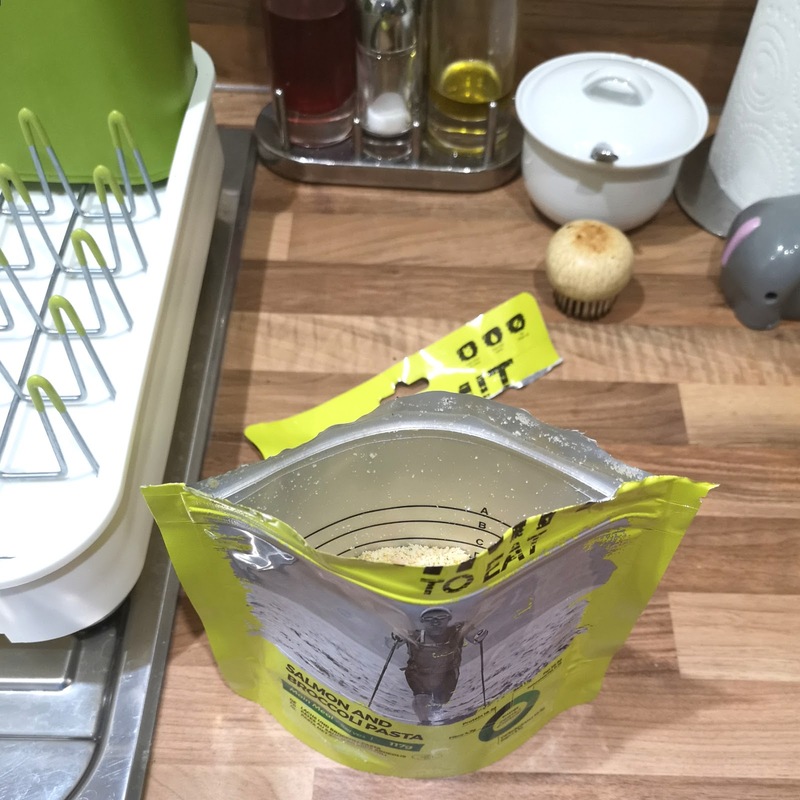 Pour 280 ml of boiling water into the pouch - there's an easy to see fill-line inside the pouch. Stir well. You need the exercise. Reseal the pouch and cover with a tea-towel to keep it piping hot. Wait ten minutes. The packaging actually suggests eight. Trust me on this. Lay the dining table. Pour some searingly dry white wine into a polished glass, and a little tap water. We don't want anyone getting squiffy. Serve in your best white china. Patterned stuff simply will not do. For members of the congregation that are either illiterate or too bone-idle to read the instructions, I have provided an easy to follow illustrated guide below. I've frequently found that dried meals taste pretty damn good when cooked in your tent. Mind you, it has to be said that I'm usually ready to eat a horse by the time I'm cooking on the hill. However, they don't travel particularly well when served at home. They too often taste like the horse I was about to eat one spoonful at a time. Summit to Eat's Salmon & Broccoli Pasta, on the other hand, tastes really, really good! You can actually see chunks of Salmon and large pieces of Broccoli in a beautiful creamy pasta sauce. Take a look at the second picture for the ingredients: Beautifully simple, with no added chemicals what-so-ever. It's not over-seasoned and is utterly delightful! A point to note, that I only realised after I had licked the last of the food from the pasta bowl, is that the packaging is quite shallow, so if you are forced to eat one of the meals out on the hill - though Lord only knows why you would want to drag your sorry carcass up a hill to eat this wonder food - you won't get your knuckles covered in food. My advice? Buy some and see for yourself. 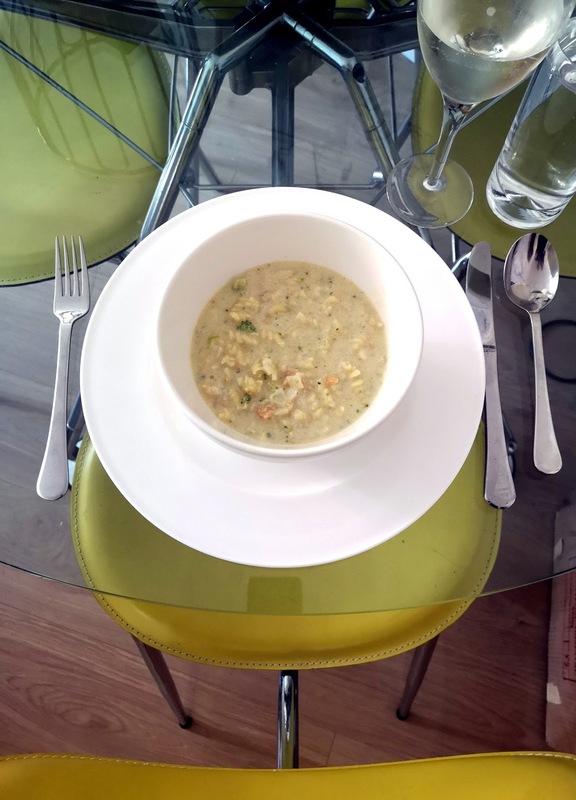 I still have another five meals (FREE ones at that!) to tickle my taste-buds and from what I've experienced so far, I'm really looking forward to them. On the hill I very often have a dehydrated pudding as a breakfast; you can only eat so many Granola Bars before your system screams for a reprieve. In another couple of my lazier moments this week I've had Summit to Eats's Custard Apple Crunch and their Chocolate Mousse with Cherry and Granola as midnight feasts. I want you to keep this a secret - just between us, okay? - as I don't want hordes of hungry hikers besieging Summit to Eat for my top favourite midnight feast/breakfast of all time only to find that when I want to order it it has sold out: The Chocolate Mousse with Cherry and Granola was bloody superb! That's not to say that the Custard Apple Crunch was poor by any means - it was pretty srummy, actually. The Chocolate Mousse was intensely chocolatey, and the cherries were bursting with cherriness! The Granola gave the pudding a bit of interesting texture, without making the dish feel too worthy. I hate worthy food... Smacks of hair shirts and vegan sandals to me. The CMwC&G is prepared with cold water, so if you're near the end of a trip and your gas is running low, this dish makes even more sense. There's 416 calories in the CMwC&G and 447 in the Custard Apple Crunch. For a longish trip I would take a ratio of three CMwC&G to one of Custard Apple Crunch. But please leave some for me as I'll be ordering a fair few of these! Because of spammers, I moderate all comments, so don't worry if your comment seems to have disappeared; It has been sent to me for approval. As soon as I see it, I'll deal with it straight away. It's All About Me, me, me, me, me! Sixty something beardy bloke who, thanks to my incredible brother David, now has three kidneys. I walked the length of Britain in 2007 and walk across Scotland every year on the TGO Challenge. Anti Wind Farm. Three Tarns....But NOT Those Three Tarns! What a difference a year makes. Training with Woodhead Mountain Rescue.